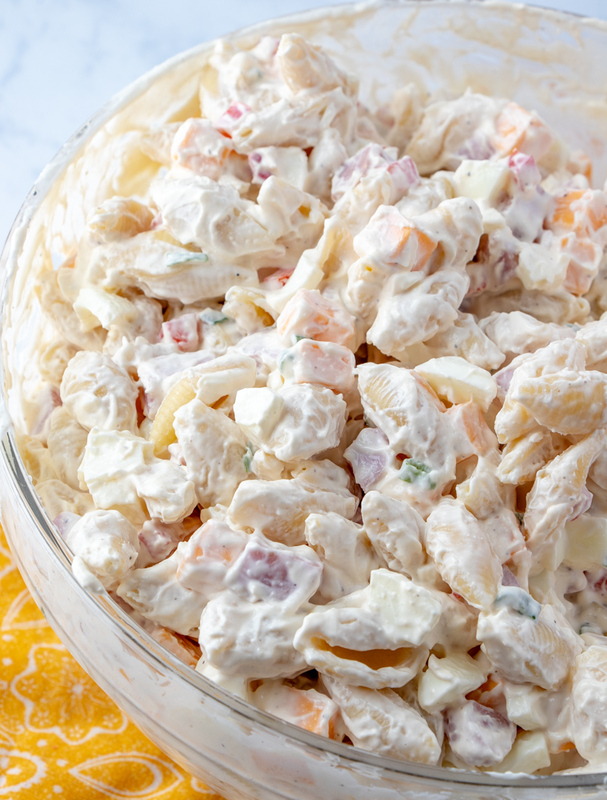 Perfect for any picnic, BBQ, potluck or event! 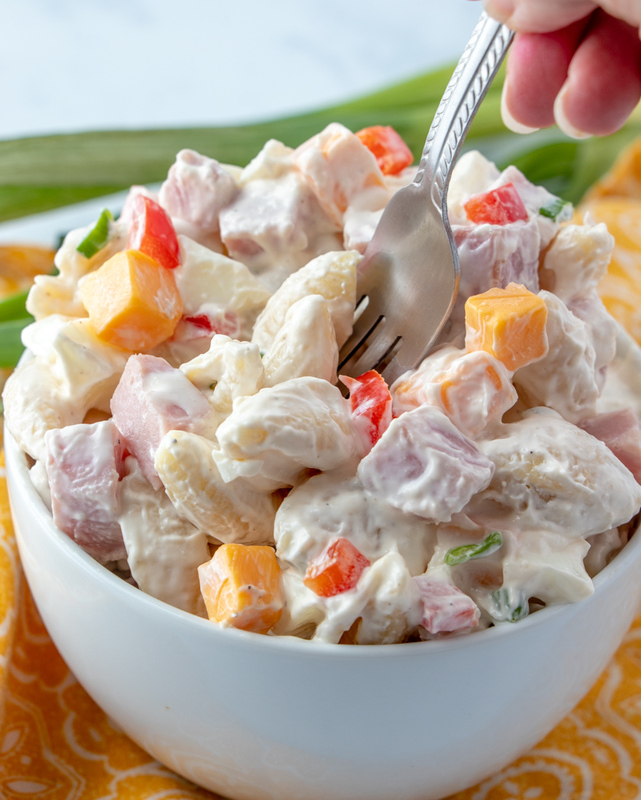 This salad feeds a crowd and it's everyone's favorite! 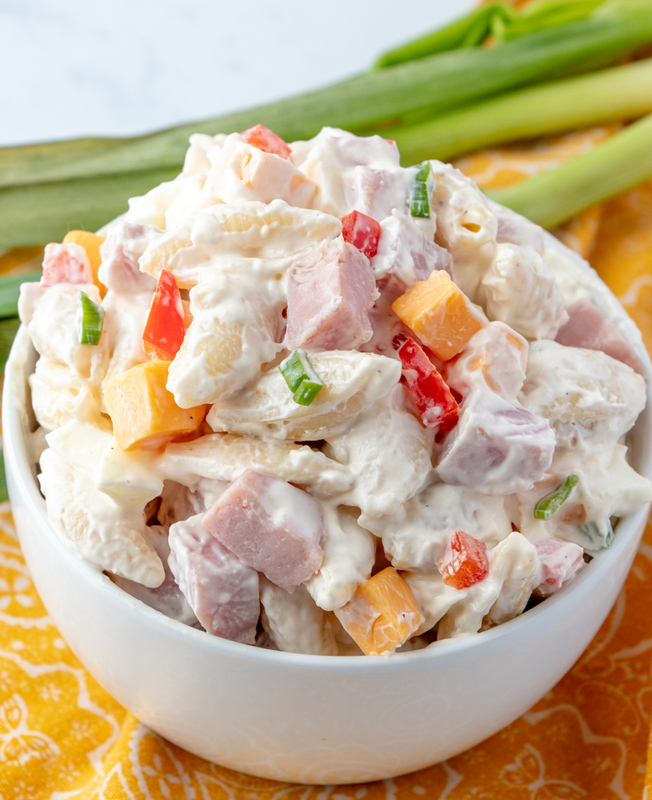 Great for using leftover Christmas or Easter Ham and hard boiled eggs! Family recipes. Aren't they just the best? Today's recipe happens to come from my sister, Shannon. She is the genius behind quite a few recipes here at the blog including Chicken Pot Pie, Almond Banket Bars, Peas and Potato Soup and French Dressing Potato Salad! In addition to creating these recipes, she also has an amazing blog called The 'Sota Stitcher! She writes about stitching, crafting, photography and travel. Shannon is so very talented and I hope you stop over and visit her! This recipe has been around the blog for awhile. 2014 to be exact! It's about time it gets a video and photo facelift now in 2019. What's really great about this salad, is it feeds a crowd! If you don't have a crowd to feed, defintely cut the recipe in half for a smaller group. 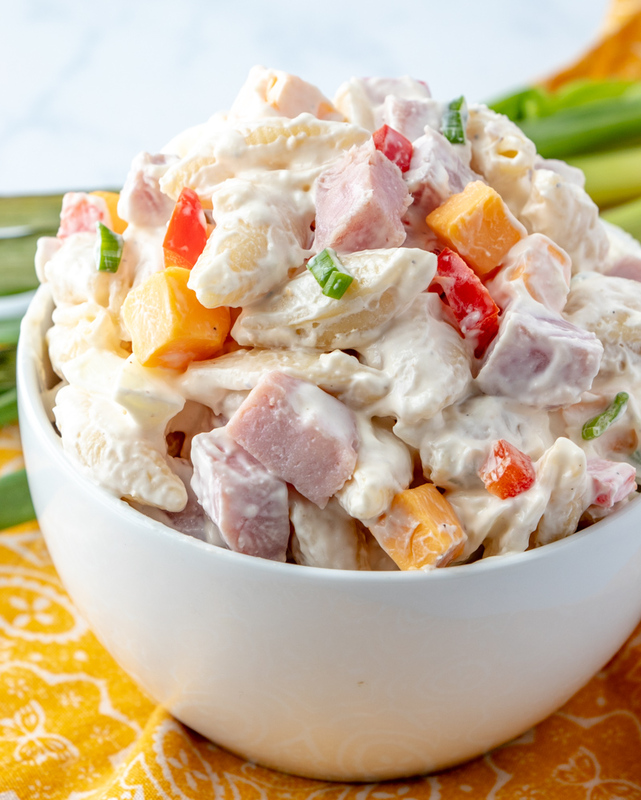 The saltiness from the ham is the perfect with the hard boiled egg whites, cheese and veggies. And so the hard boiled egg yolks don't go to waste, I'm sharing a few recipe ideas below to re-purpose them into something new. Shannon serves this at family potlucks, but also makes it at home and loves the leftovers to feed her hungry husband and son! I love making this recipe for picnics and BBQ's! Sometimes I change up the veggies or add bacon instead of ham to make it different. It always turns out amazing and delicious! The eggs really make this recipe wonderful. I mean, we really just love hard boiled eggs at home! I eat them for breakfast, snack or lunch and my daughter just loves them in her lettuce salads! You can't go wrong with an amazing egg salad sandwich too! I boil my eggs just like my mom taught me, but don't have them posted yet on the blog! My good blogger friend, Janelle has a great recipe for Easy to Peel Hard Boiled Eggs that would be a great one to use for those who are new to boiling eggs! I love to store my hardboiled eggs in containers like this, or bring them to work in containers like this one! You can store eggs for one week after they've been boiled. We love to make and prep food ahead of time to make things faster the day I need to serve the recipe! 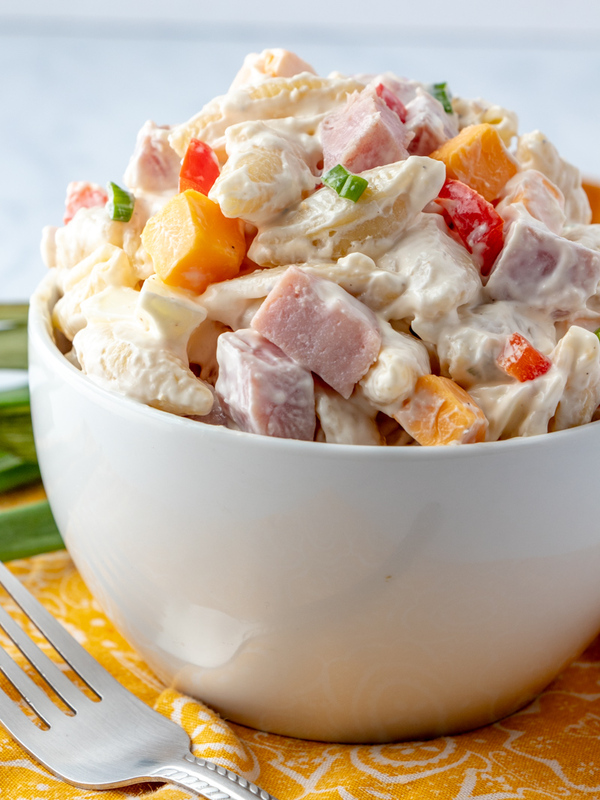 Looking for more recipes to use leftover ham? 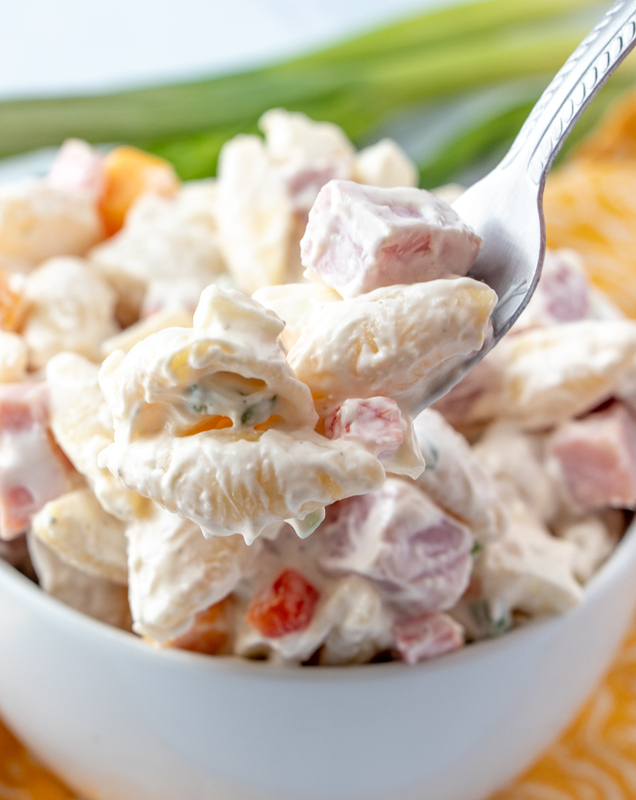 How about some more pasta salad recipes? Click each title to view the recipes! This recipe only uses egg whites, leaving you with tons of extra egg yolks! Check out these unique recipes to use hard boiled egg yolks! Cook noodles according to package directions until al dente. Drain and rinse with cold water until chilled. Dump noodles out on paper towel and pat until dry. Boil eggs, cool and peel. Remove the yolk and chop the whites. Add the noodles, egg whites, green onions, bell pepper, ham and cheese to a bowl. Mix together the sour cream, mayo and garlic powder. Add this mixture to the other ingredients and mix together. This is the prettiest salad, looks delicious too!!! Pinned and shared on FB. This looks phenomenal! :) & i meant to mention it yesterday, I LOVE your new banner! Why not the egg yolks? If you keep the egg yolk is still amazing! I actually prefer it that way. You just have to add a little bit more mayo or sour cream. I also like to throw a few diced water chestnuts in for crunch factor. Four BUNCHES of green onions?! Is that right? Yes! But you can totally do less if you don't like as many!